Jimmy Hart was in a popular rock band called “The Gentrys”, before stepping anywhere near a wrestling ring. Jimmy Hart was brought into wrestling in Memphis by Jerry “the King” Lawler, who Jimmy began managing, and later feuded with. 1982: Jimmy Hart earned national headlines doing a program with TV star the late Andy Kaufman. 1983-84: Jimmy Hart went on to manage Austin Idol, Masao Ito and Eddie Gilbertto the CWA title. 1985: Jimmy Hart was recruited by the WWF, when close friend Hillbilly Jim recommended Jimmy Hart to Vince McMahon. WrestleMania I: Jimmy Hart leads King Kong Bundy to defeat Special Delivery Jones in a record of 9 seconds. ~~~Jimmy Hart also managed Greg Valentine to retain the Intercontinental title against the Junk Yard Dog. Jimmy Hart would later sell King Kong Bundy’s contract to Bobby Heenan. 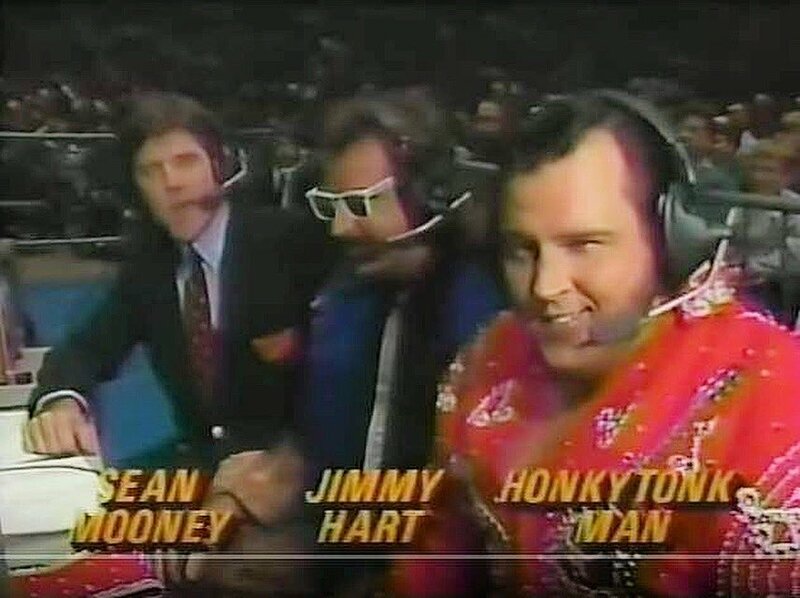 Jimmy Hart briefly co-manages the Dream Team (Beefcake and Valentine), until he phases out and gives full control to Johnny V.
WrestleMania II: Jimmy Hart leads Adrian Adonis to defeat Uncle Elmer and Funk Brothers to beat the Junkyard Dog and Tito Santana. January 26, 1987: Jimmy Hart manages the Hart Foundation to dethrone the British Bulldogs for the WWF Tag Team titles. Jimmy Hart adds referee-turned-wrestler “Dangerous” Danny Davis to his stable. Jimmy Hart began managing newcomer, the Honky Tonk Man, who began calling him the ‘Colonel’. WrestleMania III: Jimmy Hart leads the Hart Foundation and Danny Davis to defeat the British Bulldogs and Tito Santana in a six man tag. ~~~Also on the card, the Honky Tonk Man defeats Jake ‘the Snake’ Roberts. June 2, 1987: Colonel Jimmy manages the Honky Tonk Man to win the Intercontinental title by defeating Ricky ‘the Dragon’ Steamboat. Jimmy Hart also managed the WWF Women’s Tag Team champions Judy Martin and Leilani Kai, known as the Glamour Girls. 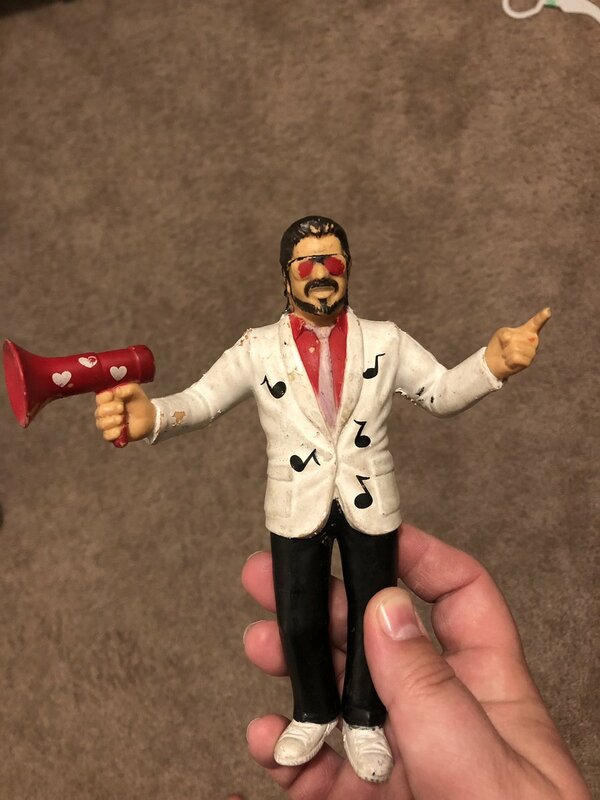 December 1987: Jimmy Hart was awarded the PWI Manager of the Year for 1997. WrestleMania IV: Jimmy Hart receives a haircut by Brutus Beefcake! 1988: The Hart Foundation turned face and severed ties with Jimmy Hart. 1988: Jimmy Hart then began managing the Fabulous Rougeau Brothers to feud with the Hart Foundation. SummerSlam 1988: Jimmy Hart accompanies Demolition and Mr. Fuji to help retain their WWF Tag titles against the Hart Foundation. ~~~Ax used Jimmy Hart’s megaphone as a foreign object to whack one of the Hart Foundation members to secure the victory. 1989: Jimmy Hart brings Dino Bravo into his stable after the departure of Frenchy Martin. Jimmy Hart managed the team of Rhythem and Blues (Honky Tonk Man and Greg Valentine) for short feud with the Hart Foundation. Jimmy Hart also leads the Earthquake in the biggest feud of 1990 against Hulk Hogan. WrestleMania VII: Jimmy Hart leads the Nasty Boys to beat the Hart Foundation for the WWF Tag Team titles. Jimmy Hart adds another tag team to his stable; the Natural Disasters – Earthquake and Typhoon. 1992: Jimmy Hart manages the Natural Disasters into a feud against the Legion of Doom. Jimmy Hart turns on the Natural Disasters to manage Money Inc (Ted DiBiase and IRS). Jimmy Hart leads Money Inc. to win the WWF Tag Team titles. 1992: Jimmy Hart loses the Nasty Boys due to his ties with Money Inc.
1993 – RAW: Jimmy Hart turns face when he comes to the aid of Brutus Beefcake after being attacked by Money Inc.
WrestleMania IX: Jimmy Hart manages Hulk Hogan and Brutus Beefcake to defeat Money Inc. by Disqualification. ~~~Later that night, Hulk Hogan returned to defeat Yokozuna for the WWF title. King of the Ring 1993: Jimmy Hart was in Hulk Hogan’s corner as he loses the WWF title back to Yokozuna. ~~~This would be Jimmy Hart’s last WWF appearance, as both her and Hulk Hogan departed the company. Jimmy Hart and Hulk Hogan briefly toured Japan and worked together on the TV Series “Thunder in Paridise”. Bash at the Beach 1994: Jimmy Hart manages Hulk Hogan to win his first WCW World title by defeating Ric Flair. Jimmy Hart is one of two managers to manage a World Champion in both the WWF and WCW (the other is Elizabeth). December 1994: Jimmy Hart is awarded his second PWI Manager of the Year. October 29, 1995: Jimmy Hart, longtime manager and friend to Hulk Hogan, turns on Hogan at Halloween Havoc to help the Giant. Jimmy Hart would become the manager of the evil faction known as The Dungeon of Doom, created by Kevin Sullivan. 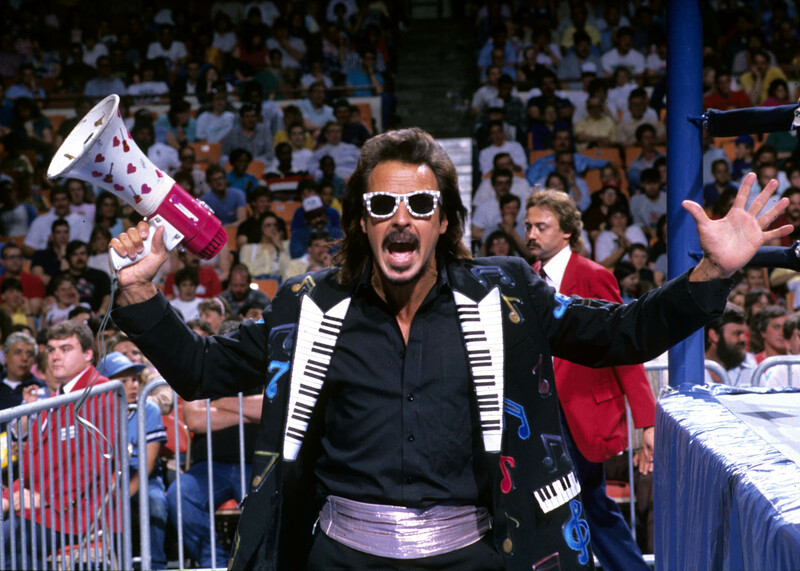 Jimmy Hart composed most of the entrance themes for WCW and is responsible for such great tunes like. Well. I can’t think of any! 2000: Jimmy Hart recreated the First Family in WCW with a brand new crop of wrestlers. Jimmy was a part owner and one of the starters of the XWF (Xtreme Wrestling Federation) along with Greg Valentine and Brian Knobbs. March 6, 2003 – SmackDown: Jimmy Hart was backstage and may be considered for a position in the production department. March 27, 2003 – SmackDown: Jimmy Hart makes a short appearance on WWE TV entering the arena with Hulk Hogan and Hulk’s son. April 16, 2003: Jimmy Hart is not a WWE contracted employee, nor are they interested in bringing him at this point. October 15, 2003 – NWA^TNA: Jimmy Hart does a phone interview and says Hulk Hogan will eventually show up in TNA for revenge. November 12, 2003 – NWA^TNA: Sting and AJ Styles w/Jimmy Hart defeated Lex Luger and Jeff Jarrett w/Don Callis. November 19, 2003 – NWA^TNA: Video is shown of Jeff Jarrett attacking Jimmy Hart during an appearance on the John Boy radio show. June 4, 2004 – TNA IMPACT (debut): Jimmy Hart is apparently on board with TNA in some kind of administrative position. July 17, 2004 – Buffalo Brawl: Jonny Puma and Jimmy Hart NC Charisma and Puff (local sports talk host feuding with Jimmy Hart to build up the show). December 26, 2004 – Memphis Wrestling: Eugene (from WWE) and Cory Maclin vs Jerry Lawler and Jimmy Hart ended in a NO CONTEST. January 21, 2005 – Border City Wrestling: Dave Lockbaum and Tyson Dux defeated Jimmy Hart and Eddie Venom. April 2, 2005 – Hall of Fame Ceremony: Jimmy Hart was inducted into the WWE Hall of Fame along with 6 others in Los Angeles. July 1, 2005 – Memphis Clash of the Legends: Jerry Lawler and Renee w/Jimmy Hart beat Scufflin Hillbillies (Jethro and Maybel). ~~~Later in the same card: Jerry Lawler w/Jimmy Hart vs Dutch Mantel w/Jimmy Valiant ended in a NO CONTEST. July 22, 2005 – Border City Wrestling: They had a Hart Foundation Reunion with Jimmy Hart and Jim Neidhart and Bret Hart. August 13, 2005 – Ballpark Brawl: Jimmy T (Local DJ) and Kamala defeated Jimmy Hart and Lanny Poffo. September 10, 2005 – Wrestle Reunion: Greg Valentine beat Tito Santana to win the IWA title when Jimmy Hart threw in Brass Knux. October 3, 2005 – WWE Homecoming: Jimmy Hart participated in a Legends Ceremony which included roughly 24 Legends. November 19, 2005 – CCW Tribute to Starrcade: The Masked Superstar defeated The Barbarian w/Jimmy Hart. January 29, 2006 – BANG Wrestling: The Claw defeated Lexie Fyfe with the help of the “Mouth of the South” Jimmy Hart. ~~~Dory Funk presented Jimmy Hart the Funking Conservatory Fighting Heart Award for outstanding performance in wrestling. March 5, 2006 – World Wrestling Legends PPV: “Superfly” Jimmy Snuka defeated Greg “The Hammer” Valentine w/Jimmy Hart. October 21, 2006 – FPWA: Modern Day Theory w/Jimmy Hart) beat Rod Steel and Bruce Santee w/Amy Love to win the Tag Team titles! April 1, 2007 – WrestleMania 23: HOFer Jimmy Hart made a brief cameo during a backstage dance party started by Cryme Tyme. April 27, 2007 – Memphis Wrestling: Jimmy Hart formed a new “First Family” with Bobby Eaton, Koko Ware and Slick. November 7, 2008 – Jerry Lawler Tribute Show: Jerry “The King” Lawler w/Jim White defeated Sid Vicious (with Jimmy Hart). December 6, 2008 – Highspots presents “The Nature Boy” – Ric Flair gave an emotional speech in the middle of the ring. ~~~Reid Flair (debut) and David Flair w/Ric Flair defeated The Nasty Boys w/Jimmy Hart) with special guest referee Hulk Hogan. ~~~The match ended with all three Flair’s doing figure-4 leglocks on the Nasty Boys and Hart while Hogan “turned his head”. November 21, 2009 – Hulkamania Tour (Melbourne): Jimmy Hart managed the Nasty Boys, Brutus Beefcake, and Hulk Hogan. November 24, 2009 – Hulkamania Tour (Perth): Jimmy Hart managed the Nasty Boys, Brutus Beefcake, and Hulk Hogan. November 26, 2009 – Hulkamania Tour (Brisbane): Jimmy Hart managed the Nasty Boys, Brutus Beefcake, and Hulk Hogan. November 28, 2009 – Hulkamania Tour (Sydney): Jimmy Hart managed the Nasty Boys, Brutus Beefcake, and Hulk Hogan. February 14, 2010 – TNA Against All Odds: The Nasty Boys defeated Team 3-D with help from returning manager Jimmy Hart! January 29, 2011 – Pro Wrestling Guerrilla: Jimmy Hart participated in a Legends Wrestle-Royale in Los Angeles, California. @RobKovach999 @gailkimITSME @heroesanlegends @amberoneal1 @wow_BHB @ShaneHelmsCom @itsjerrylynn @Tess_Blanchard @RealKevinNash @dlobrown75 @RealKongoKong @RealJimmyHart @DanielleMoinet Amber O'Neal was following me, but she blocked me without an explanation. 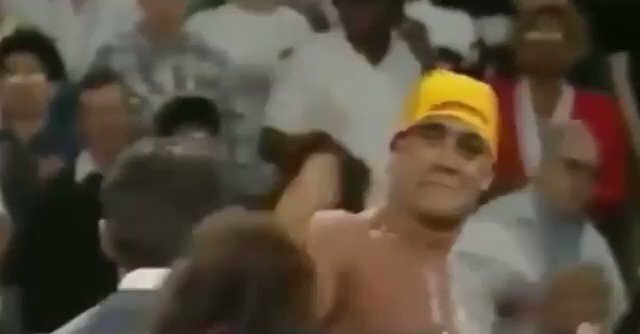 Rare footage of @HulkHogan celebrating with Vince McMahon, Randy Savage, @brutusbeefcake_ and @RealJimmyHart after WrestleMania IX went off the air!